Historicist: "Henry Moore's big bronze whatchamacallit"
Image from the Globe and Mail, October 26, 1966. Revell was hopeful that the massive public plaza before the civic building would also reflect the city’s increasing culture and sophistication through the installation of a suitably monumental abstract sculpture. The result—the first major work of modern art erected in a public space in the city—prompted a summer-long controversy in 1966, as taxpayers and politicians alike decried the frivolous expenditure. 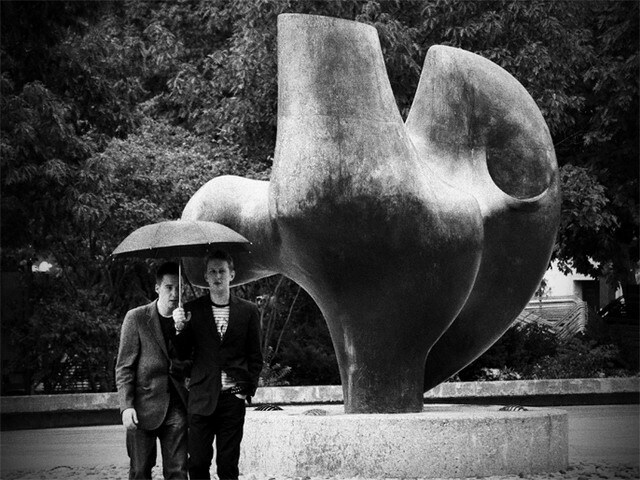 The sculpture Revell had in mind was a piece by Henry Moore (1898–1986). The Yorkshire-bred artist, who’d trained at the Leeds College of Art and the Royal College of Art, was widely considered the most accomplished sculptor of his age. He’d won the International Sculpture Prize at the Venice Biennale, and had ever since been awarded a growing number of public commissions across Britain, and in Europe and Chicago. Having grown uncomfortable with classically-derived ideals of sculpture—and influenced by his school days’ explorations of the ethnographic collections of London-area museums—Moore forged his own distinct mode of three-dimensional abstract sculpture composed of voids and round, organic shapes. Mid-century Toronto seemed immune to such trends in modern art, as the city’s leading sculptors like W. S. Allward and Emmanuel Hahn continued with the sort of representational sculptures their clientele preferred. Revell died in November 1964 and, as Professor Eric Arthur later explained, out of affection for the architect and his building, Moore went ahead and created the sculpture without a commission. The Art Advisory Committee for the New City Hall, of which Arthur was chairman, therefore recommended the purchase of Moore’s piece for $120,000 at a Board of Control meeting in March 1966. The strongest advocates of purchasing Three Way Piece No. 2 were Mayor Philip Givens and Alderman Horace Brown. Others did not pretend to be art critics and merely deferred to the judgment of Arthur’s committee. Photo by Jay Morrison from the Torontoist Flickr Pool. In the next day’s Globe and Mail, one observer of the meeting, an elderly woman named Lillian James, expressed her displeasure that such a sum would be spent on abstract art. She felt taxpayers should not support such a frivolous expenditure and suggested the money be spent on hospitals. Others echoed her sentiments—wanting the money spent, for example, on programs for youth—as controversy flared throughout the summer. Dennison’s opposition to the acquisition of Moore’s sculpture deepened and grew more vocal. City Council expressed their displeasure about Moore’s piece by balking at an initiative to recruit the two evening newspapers to assist with a public campaign raising funds for Three Way Piece No. 2. By the end of the month, Givens found himself with few allies willing to draw public ire for whole-hearted support for purchasing the sculpture. The Board of Control distanced itself from its earlier decision. Rather than commit public funds, Givens spearheaded a campaign to raise public donations. By the end of March 1966, one anonymous donor had committed $20,000 towards the purchase. By late April, public donations reached $70,000; and the final tally was in excess of $100,000 by the end of June. Photo by Alfred Ng from the Torontoist Flickr Pool. Meanwhile, the mayor had been negotiating with Moore behind the scenes. 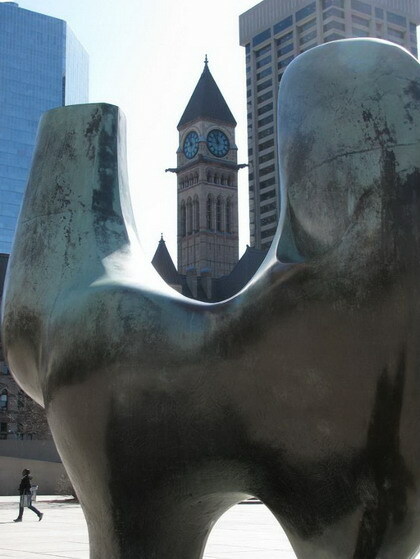 He secured a promise from Moore in April 1966 that the artist would, upon purchase, provide the original of the bronze to Toronto and make only one other casting for a museum in West Berlin. Through indirect negotiations carried out in London by Toronto gallery owner Blair Laing or photographer Roloff Beny, Givens succeeded in negotiating Moore down to a $100,000 price tag. 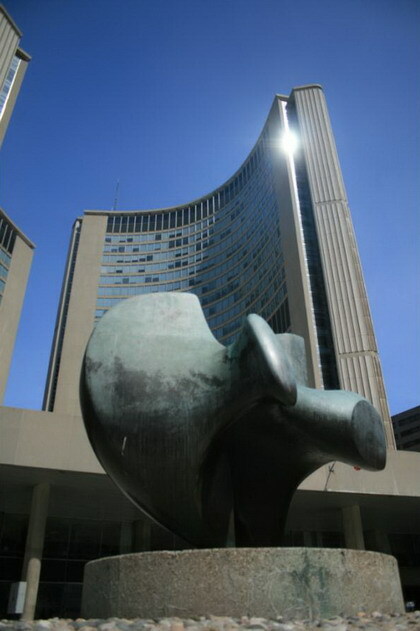 Moore, it turns out, cut his asking price, according to the Globe and Mail, “as a personal contribution in memory of Finnish architect Viljo Revell.” And once the publicly raised funding was secured and Givens was ready to cut a cheque, Moore declined the mayor’s offer of a $15,000 deposit until the sculpture was actually installed in Toronto, and agreed to take the balance in four annual installments of slightly more than $20,000 each. City Council, however, was not about to roll over and admit defeat. In late June, councillors Alice Summerville and Fred Beavis initiated a campaign to relegate the sculpture to a back corner, an out-of-the-way pocket of the public square, rather than a prominent location. After some debate, the rest of council relented and approved placing the sculpture in its prominent location, roughly twenty feet east of the main flagpole. All councillors but Beavis voted in favour of accepting The Archer as a gift to the city. The bronze sculpture arrived by ship in late October, even as controllers Dennison and Archer—now both running for mayor against Givens—continued to blast Moore’s piece at public meetings (calling the artwork an example of “municipal folly”) on the eve of its arrival. Such tactics, Givens later felt, hurt the incumbent mayor with the public. “Some object to modern art and feel it is being foisted on them,” he said. “Others think the mayor should be looking after sewers, sidewalks and potholes and nothing else.” With public support of abstract art as an election issue, Givens was not returned to mayoral office at that year’s municipal election. The sculpture arrived aboard the Dutch freighter Prins Philips Willem on October 25, 1966. This transportation, which could have cost upwards of $15,000, was provided gratis, as was the truck carrying the package, nearly fifteen feet tall, from the docks to the public plaza and the crane that raised it into place. In all, despite the public controversy, Givens hadn’t actually spent any public money to acquire Three Way Piece No. 2. Although Moore was not able to travel in order to supervise its installation on a low, cement platform in the square, architect John C. Parkin and the city’s Works Commissioner, Ray Bremner, were in constant telephone communication with the artist while overseeing the installation. The sculpture was kept under close guard behind hoardings until the official unveiling on October 27, 1966. On that chilly evening, there was a crowd of between five and ten thousand to witness the unveiling of the controversial sculpture. 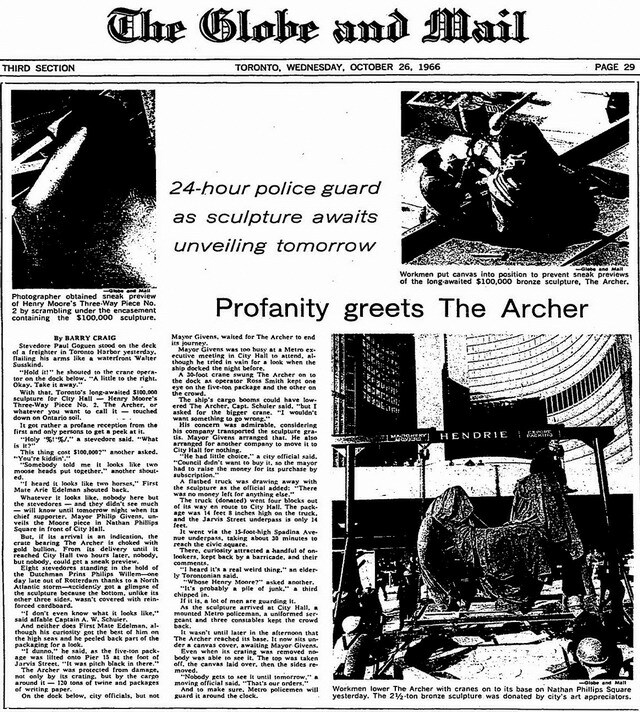 Although depictions of The Archer had appeared in the newspapers, this was the first occasion for the general public to see what the Globe and Mail had dubbed “Henry Moore’s big bronze whatchamacallit” for themselves. Image from the Toronto Star, October 28, 1966. Once the police had settled the scene, Givens gave his speech. “Posterity will remember tonight,” the loudspeakers boomed his words to the gathered crowd. “The Philistines have retreated in disorder.” Moments later, he pulled back the canvas. Newspaper reporters listened closely the reaction of those gathered on the scene. “Good grief,” said one teenage member of the crowd. “What is it, mommy? What is it supposed to be?” asked another young observer. A tourist from Bermuda scoffed: “I think it’s horrid. Actually, I can’t make head or tails of it.” He added that his own countrymen would never have spent such money this way. By October 29, one newspaper reporter estimated that over fifty thousand people had come to see the sculpture, spending an average of five minutes each, wandering and gazing at the three dimensional piece. At such a pace, the reporter felt that 2,400 people viewed Moore’s sculpture each hour. Looking back, Warkentin credits the installation of Three Way Piece No.2 as the moment when “modern sculpture was introduced into the city at large with a bang.” The controversial art installation, although initially protested, was first seen with aversion and then as one of the city’s most loved landmarks. Real estate developers and corporations followed this lead and began commissioning outdoor abstract artwork to make their buildings distinctive—and to negotiate special concessions on zoning regulations. Although debates about good taste or the quality of artwork would always persist, the general public no longer derided the idea of modern art in public spaces as wasteful spending. CORRECTION: JULY 19, 2010 This article mistakenly said that Moore’s Three Way Piece No. 2 was unveiled on October 27, 2010—that year, of course, should read 1966.